This week marks the release of the first expansion to Rockstar North’s 2008 critical hit Grand Theft Auto 4. The Lost and the Damned expansion is available for download on Xbox live today and follows the story of biker Johnny Klebitz. The game is set, once again, in Liberty City and features the same beautiful and realistic graphics and game play from the original GTA4 release. has been rated M by the ESRB and can only be played on the Xbox 360 with the original GTA4 game disc. Also available today is Street Fighter 4. This title marks Capcom’s return to the classic arcade fighting of Street Fighter 2. Players will recognize series veterans like Ryu, Ken and Chun Li and will also enjoy several newcomers. Capcom has brought the Street Fighter series into this generation with beautiful 3D graphics, while still maintaining its essential 2D fighting experience. Street Fighter 4 has been rated T by the ESRB and is playable on both the Xbox 360 and the Playstation 3 . 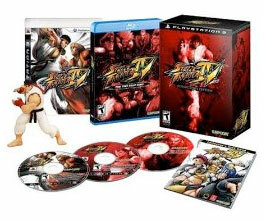 A Collector’s Edition is also available for both formats which includes a collectible Ryu figurine, CD soundtrack, and a 65-minute full-length Anime movie titled “Street Fighter IV – The Ties That Bind.” The PS3 version includes a Blu-ray version of the movie. wonder if the anime movie on Blu-ray disc is actually high-def? Or just upscaled?